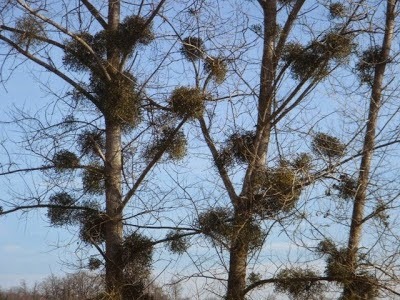 There is an awful lot of mistletoe in Herefordshire. Many mature trees are festooned with it, the large bunches easy to see now that the leaves have fallen. Apple trees in orchards are weighed down with it. I have some on my own apple trees in my garden. 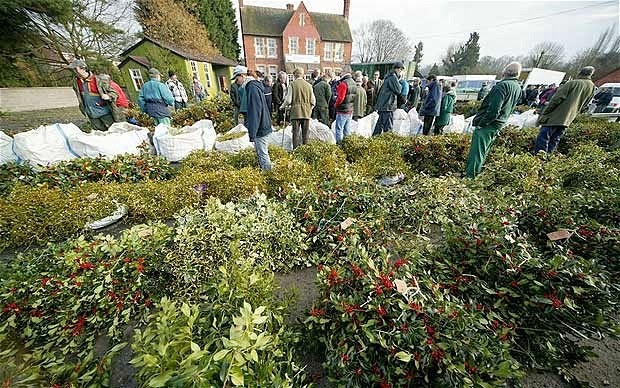 In December the mistletoe is harvested and a mistletoe market is traditionally held in Tenbury Wells on three consecutive Saturdays before Christmas. It is an institution. Holly is for sale too in huge piles. Buyers come from miles around. But in Herefordshire, in past centuries, mistletoe was not considered a plant to encourage much kissing in this festive season. Rather it was believed to be a plant of magical properties, and the activities associated with it certainly go back to a pre-Christian age. Based on the research done by Ella Mary Leather in the 1920s, interviewing local folk (the Folklore and Witchcraft of Herefordshire), the custom all over Herefordshire, certainly until the final years of the 19th Century, was to weave a globe of hawthorn and mistletoe into a 'bush' which was hung in the kitchen on New Year's Day. There it would remain throughout the year until the next New Year's Day when the bush with its mistletoe would be taken outside and burned. At the same time a new 'bush' would be woven, sometimes cider poured over it and the ends of the branches scorched in the fire, and brought back into the kitchen for the following year. Definitely the remnant of some primitive ritual. 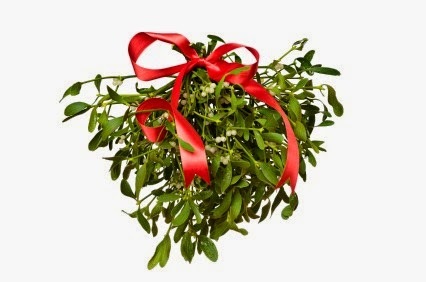 New mistletoe was NEVER brought into the house at any time between one New Year's Day and the next. It would be considered highly unlucky to do so. The burning of the old bush on New Year's Day took place very early - sometimes as early as five o' clock in the morning - so that the evil spirits from the old year would be caught up in it and destroyed, thus giving the New Year a good start free from evil. While the old bush was burning, the new one was woven, for the house must not be left without this protection. Much cider was drunk and cake eaten. 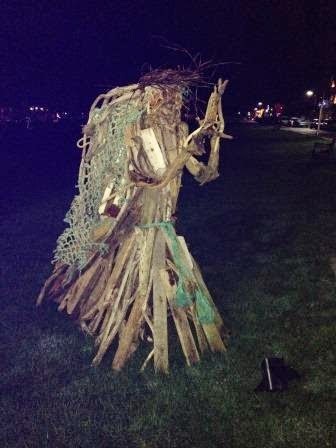 Sometimes there was dancing and singing by the men-folk in a ring around the fire. 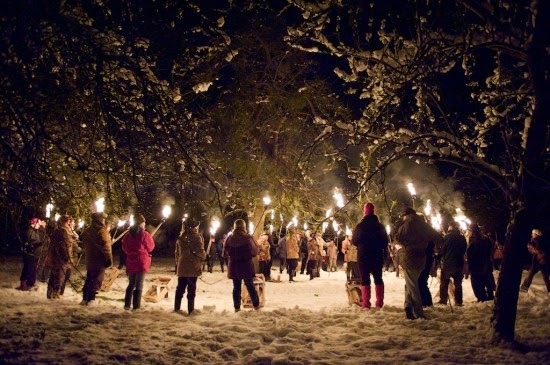 We still see this custom, particularly on 6th of January, when the Leominster Morris Men perform the traditional wassail in one of the local orchards. In some areas fire from the burning bush was carried across the fields and orchards to ensure a good crop. It was believed that without this ceremony the crops and the apples would fail. One belief was that the bush represented Our Lord's crown of thorns and when they carried the fire across the fields they were driving away the 'old un' (the Devil). So kissing under the mistletoe in Herefordshire? No chance! Is this custom of burning the bush still carried out today in rural households? But I burned my bunch of mistletoe from last year on the 1st January. I didn't dance around the fire, or sing, but I certainly drank a glass of cider and ate cake. Ah, but did I perhaps also kiss my husband under the mistletoe? My best wishes to all for 2015. Keeping nutmeg in your pocket during New Year's Eve will protect you throughout the next year- so says one old medieval belief. I discovered this nugget whilst browsing www.moonsmuses.com , a blog devoted to medieval recipes, herbs and plant lore. Nutmeg would protect you if you happened to fall from a roof, cliff, ladders or other high places. It was, of course, a highly expensive spice during the middle ages. Reading about spices has sent me on a search for medieval Christmastide recipes fit for a monarch which I thought might also interest historical fiction readers as we approach the New Year. In most medieval households cooking was done on an open hearth in the middle of the main living area. 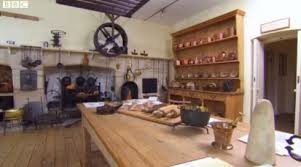 For most of the medieval period, for most households, the kitchen was connected with the dining hall. It was towards the end of this period that the kitchen generally became separated, though change is a slow process. Often, separate kitchens did exist in castle baileys as they could be a fire risk. By the late middle ages, however, a separate building or wing that contained a kitchen area was created from the main building by a covered walkway. Here, one would find frying pans, pots, kettles, waffle irons, spits skewers of all sizes, pots and cauldrons, ladles and graters, just to name but a few of the utensils they had then and which we use to this day. Importantly, there would also be mortars, pestles and sieve cloths because fine textured food was deemed good for you. The body could more easily absorb nourishment. Skilled cooks could shape the results. Farcing, for instance, was to skin and dress an animal, grind up the meat, mix with spices and other ingredients and return it to its own skin or mould it into the shape of a completely different animal. During the Christmas period the kitchen staff of royal courts were extremely busy. The staff consisted of pantlers, bakers, waferers, sauciers, larderers, butchers, page boys, milkmaids, butlers and scullions who were kept incredibly busy preparing at least two meals a day for several hundred people. Importantly the chief cook would need at least a thousand cartloads of dry wood and a barnful of coal to hand for the preparation of the two day long banquet. ( Du fait Cuisuine 1420, written by Maister Chiquart for the then Duke of Savoy). Here are a few recipes that would have been cooked in the royal kitchens over the festive season. These are adapted for the modern cook. Preheat the oven to 325 f. Combine all the ingredients to prepare the marinade. Dip the whole chicken into it. Let it sit for 4 to 5 minutes. Place the chicken on a sheet pan and cook for 50 minutes uncovered, or until the chicken juices run clear. Or why not try this easy medieval inspired recipe (from coquinaria.nl) for Medieval Apple fritters, traditional fare on New Year's Eve in the Low Countries. Apples and quinces were regarded as a similar fruit during the period. They were originally small and sour. By the end of the medieval period there were several apple varieties. The Costard was a large kitchen variety and the Pearmain Green, which was green and red coloured, were both known by the thirteenth century. Other medieval apples were Nonpareil, White Joaneting and the Royal Russet. Fritters appeared frequently on the medieval banquet table. There were sweet and savoury fritters. Take wheat flour. Take ale yeast, saffron and salt. Beat all together as thick as you would make other batter on meat days. Then take good apples and cut them in the manner of fritters. Dip in batter up and down and bake them in good oil. Lay them on a dish, sprinkle with sugar and serve them. To make these nowadays you would have to use yeast. English ale was originally the same as medieval beer. It was top fermenting and instead of hop gruit was used, a mixture of sweet gale and other herbs such as rosemary and sage. Ale could be sweet or sour depending on the composition of gruit and the brewing. Medieval beers were never bubbly because the carbon dioxide escaped during the fermenting. On the Medieval New Year's Day everybody celebrated The Feast of Fools. For that celebration class distinctions were abolished. Most Europeans elected a Lord of Misrule or a king of fools. In England he went as King of the Bean or in Scotland, the Abbot of Misrule. They had the power to call everybody to disorder with cross-dressing, bawdy songs and drinking to excess. The end came when the Protestant Reformation condemned all politically incorrect excesses claiming their roots in paganism. The Feast of Fools has since been celebrated on the twelfth night after Christmas. Finally I leave you with a medieval caudle recipe. Beat up egg yolks with wine, sugar and saffron. Heat the mixture over a medium flame. Stir continually until the caudle is hot and thick and fluffy. Beat well together; set it on the fire on clean coals. Stir well the bottom and sides until just scalding hot; you will be able to tell when it becomes fluffy. Then take it and stir fast & if you need add more wine; or if it rises too quickly, put it in cold water to the middle of the outside of the pot, stir it away fast, and serve. 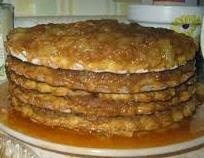 Thanks for this recipe to godecookery.com. 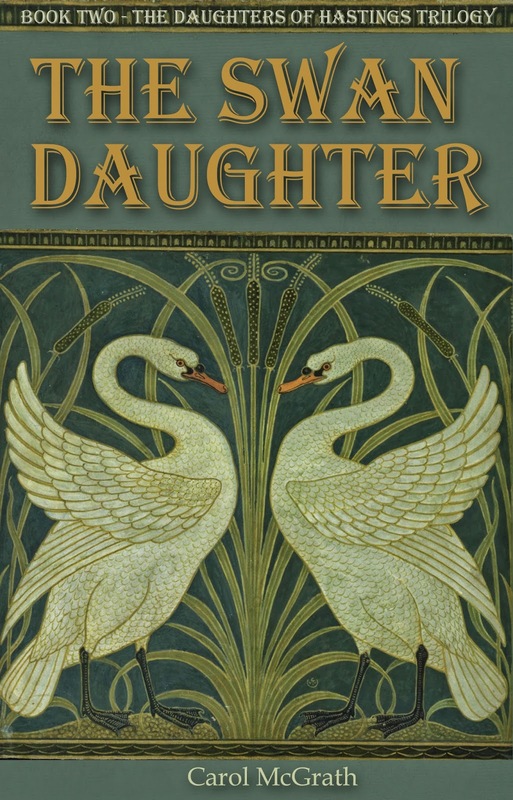 The Swan-Daughter published 2014 by Accent Press. Both available as paperbacks and for all e readers. A few weeks ago, I watched a movie that I had wanted to see for months, Belle. 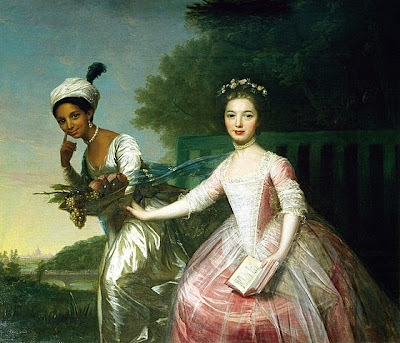 The screenplay was inspired by the portrait shown above, that of Dido Elizabeth Belle and her cousin Lady Elizabeth Murray, both of whom were raised in the home of their respective great-uncle, William Murray, the 1st Earl of Mansfield and Lord Chief Justice. The movie is beautifully filmed with gorgeous costumes and a very dramatic story line which includes Belle’s inheritance of a large fortune of 2000 pounds a year from her father, an offer of marriage by a young man of good birth (following a crude and indecent approach by his brother who was courting Lady Elizabeth, who was depicted as a poorer relation), and the shared interest in a highly controversial court case with a handsome young lawyer named John Davinier, to be decided by her uncle, an insurance case involving a claim filed following the drowning of 142 African slaves from the ship the Zong sometime after November 1781 whose owners tried to claim insurance for damaged cargo. This shared interest, in the film, led to romance and Belle’s refusal of a much more advantageous offer. I enjoyed the movie very much and was afterwards led to read more about Dido Elizabeth Belle. The first thing I learned is that she was actually called Dido. Her last name, Belle, was actually a version of her mother’s name (her name was Maria Bell). Her father, Sir John Lindsay, brought her to Lord and Lady Mansfield in late 1763 and asked them to raise her. There are multiple theories about the relationship between Maria and Dido’s father. One is that her mother was a slave on a ship captured by him, was kept by him, had Dido, and at some point died when Dido was a young child, and that her unmarried father brought her to his uncle to raise as he was sailing again. Another is that he had brought Maria to England where Dido may have been born and took Maria with him when he sailed back to the colonies leaving Dido in his uncle’s care because of her youth. In 1764, when Dido was aged 3, Lindsay was sent to Pensacola. This would be a reasonable time for Dido have been left in England. It seems that Maria accompanied him. Margo Stringfield, an archaeologist at the University of West Florida, conducted a dig at the site of a house belonging to a Maria Bell on the corner of Lindsay and Mansfield streets and found a deed signed by Sir John Lindsay conveying a lot in Pensacola to Maria Bell in 1772 and guaranteeing her freedom. It appears that Sir John and Maria returned to London at some point and their relationship continued after he married in 1768. Maria returned to Pensacola in 1774. There is no indication that Sir John or Maria tried to remove Dido from Lord Mansfield’s care. The next thing I discovered is that there is actually little known about Dido herself. She was in fact raised in the household with the family, dressed, educated and housed on the same footing with her cousin Lady Elizabeth Murray, the daughter of another nephew Viscount Stormont, British ambassador to Vienna, and his wife Henrietta von Bunau. Lady Henrietta died in 1766, and Viscount Stormont did not feel he could bring up a child himself in a foreign country so asked his uncle to care for her. Interestingly, church records record the baptism of Dido Elizabeth, aged 5 years, on November 20, 1766. So in 1766 the childless Lord and Lady Mansfield had two little girls of almost the same age to raise and apparently decided to raise them together as sisters. It is very clear that Dido was not raised or treated as a servant. Both girls were well dressed, well educated, and housed as family members. The main difference seems to be that when visitors dined Dido did not join them for the meal but did appear afterwards in the drawing room for coffee where she socialized with them. Another area of difference was the matter of an allowance: Lady Elizabeth’s allowance was 100 pounds per year, while Dido’s allowance was 30 pounds 10 shillings per year (now worth more than $450,000.00 and twice the annual salary of a coachman at the time). Before assuming the worst, it is important to recognize that Lady Elizabeth was legitimate and titled, and the status and fortunes of their respective birth fathers varied widely. At the time, it appears that the issue of illegitimacy was at least as important (if not more important) as that of race, and Dido was undeniably illegitimate. In Emma, Jane Austen showed that the biggest drawback to a good marriage for Harriet Smith is her illegitimacy. In her last and uncompleted novel Sanditon, Jane Austen included a character, Miss Lambe, who is a West Indian heiress of 17 who is half mulatto and frail. There is no indication that Miss Lambe is unacceptable to society. By all accounts, Dido had some duties around the house including some supervision in the dairy and poultry yard. It must be noted that it was not uncommon for women of rank to have involvement with the operation of their households including releasing certain sundries that were kept locked up such as tea and stillroom remedies, household sewing, and so forth. Dido’s tasks would not have been considered unusual. Some of what is known about Dido is from the diary of Thomas Hutchinson, Governor of Massachusetts, who was quite outspoken in his entries about the “black” in Lord Mansfield’s house; he seemed quite shocked to see her treated as a family member. At some point, Dido also began to help Lord Mansfield with his correspondence which is a testament to her education. Lord Mansfield had a long career as a lawyer and a judge. He was also a Member of Parliament for a time and, as previously mentioned, became Lord Chief Justice. As an earl, he also served in the House of Lords. He was known for his gift of oratory and for his ability to focus on the law itself, making rulings on the requirements of the law as opposed to larger issues of morality, fairness, or emotion. He heard and ruled on many cases with far-reaching impact, but he heard two cases which had specific impact on the slave trade and the abolitionist movement in England. In the first, known as the Somerset Case, he ruled in 1772 that a black defendant named James Somerset could not be taken out of England and returned to slavery in Virginia against his will because he could not say that the law of England allowed such action. In the second case, the Zong massacre case mentioned above, in 1783, he heard the particulars of the case, which involved 142 sick Africans were thrown off the ship and left to drown. The owners pled that it was necessary due to a shortage of water to sacrifice those to save the greater number and tried to claim insurance for the damaged cargo based on the loss of the slaves cast overboard. Evidence was presented that disputed the need, and issues of murder and deliberate destruction were raised. He ultimately indicated that the insurers were not liable for mistakes made on board ship. Although another trial was ordered, there seems to be doubt as to whether the trial was held. I have found conflicting reports on that. The fact that he had a black girl in his home, for whom he felt affection, was raised by many as an indication that he could not possibly be unbiased in cases involving blacks. 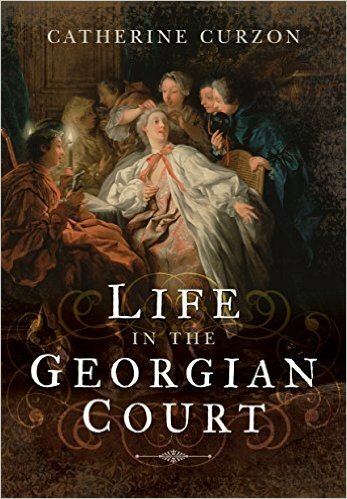 The movie suggests that Lord Mansfield discussed the Zong case with Dido, or at least in her presence, that she had access to notes and paperwork on this case, and that she influenced his thinking on the case. (The business of taking papers out of Lord Mansfield’s house to give to her young lawyer lover was clearly fictionalized.) I think much of this is overblown. However, I do not see how he could have had a child in his home, raised and educated the child and loved her as it appears he loved Dido, and been unable to recognize her humanity, regardless of colour. The portrait of the two girls that he raised together does not put one above the other. I feel it impossible that he did not recognize humanity in others. Certainly, in assisting him with correspondence, Dido may have known some particulars about the Zong case and discussed it with Lord Mansfield. However, it is important to remember his ability to separate his decisions from emotion and morality to base them on the laws themselves. In both cases, he found a basis in law (or rather the lack of law in the Somerset case) to make his rulings. I think it entirely probable that Dido influenced him, directly or indirectly, to scrutinize the law to find solutions that satisfied the legal requirements of the cases at hand and his own conscience. Lady Mansfield died in 1784, and Lady Elizabeth married in 1785 becoming Lady Finch-Hatton and a neighbour of the Austen/Knight family in Kent. By this time, Lord Mansfield was 80 years old, and in poor health. Two female relatives (middle aged spinsters), Ladies Anne and Margery Murray, joined the household. Lady Anne took over the household, and Dido was more involved with assisting Lord Mansfield, actually writing letters on his behalf involving legal matters. He updated his will, leaving Dido 500 pounds and an annuity of 100 pounds per year and specifically noted that she was a free woman. Lord Mansfield retired on June 4, 1788, which was the same day Sir John Lindsay (now Rear Admiral) died. He left a legacy of 1000 pounds to an illegitimate son and 1000 pounds to a daughter named Elizabeth who may (or may not) have been Dido. Most sources indicate that Dido inherited from her father, but there seems to be some uncertainty about it. Lord Mansfield died in March of 1793. Viscount Stormont inherited the title and the property. Thanks to Lord Mansfield, Dido was left a wealthy woman by the standards of the day. However, as an unmarried woman she also faced certain difficulties, including where to go. There is no indication that her cousin Lady Elizabeth offered her a home, and there is also no indication that the new Lord Mansfield was willing to have her stay on. At this point, Dido was about 32 years old, and there is no indication of any romantic interest in her life (nor even a significant opportunity to meet men). As mentioned previously, her illegitimacy would have been a serious impediment to making an advantageous marriage, and it seems likely that race would also have been a consideration. However, marriage would seem to be the logical answer: she was beautiful, accomplished, wealthy and (although illegitimate) had noble blood in her veins. 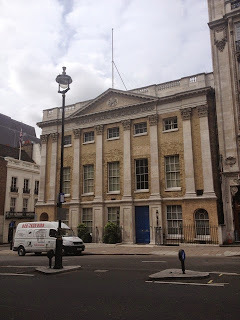 Dido married 9 months after Lord Mansfield’s death to John Davinier at St. George’s, Hanover Square (one of the most fashionable churches in London) by license on December 5, 1793 according to the marriage register. It is speculated that the new Lord Mansfield had connections from his time in Paris as ambassador, including servants, and may have arranged a match for Dido with someone. It appears that Mr. Davinier was French and had been a steward. Little else is known about him. The fact that the marriage was at St. George’s and by license (an expensive wedding) indicates someone of influence was involved, and the new Lord Mansfield seems like a likely candidate. Dido and her husband had 3 sons, Charles, John, and William. In 1799, Lady Margery Murray (one of the spinster relative who joined the household after Lady Mansfield’s death) died and left Dido 100 pounds, being careful to add a codicil acknowledging Dido’s marriage and leaving it to Dido out right and to use herself (worded carefully to be sure it went to Dido herself and not to her husband). Dido died in 1804 at approximately 43 years old. The cause of her death is not known. She was buried in St George’s, Hanover Square burial ground on Bayswater Road. Her husband and 2 of her sons, Charles and John, outlived her. Austen, Jane. Emma. The Novels of Jane Austen. Vol. IV Oxford University Press: reprinted 1988 (3rd edition). Sanditon. The Works of Jane Austen. Vol. VI Minor Works. Oxford University Press, reprinted 1988. Jane Austen's Regency World. Lansdown Media, Issue 67, Jan./Feb. 2014. “In the picture?” by Christine Kenyon Jones. PP. 22-26; Issue 69, May/June 2014. “Being Belle” by Anne Horner. PP. 16-22. Portrait of Dido Elizabeth Belle and Lady Elizabeth Murray, attributed to Johann Zofany, a photo by Paul Barlow taken 6/20/2014, from Wikimedia Commons. Lauren Gilbert, author of HEYERWOOD: A Novel, lives in Florida with her husband. Her second novel is due out sometime in the winter of 2014-2015. She will be at the Amelia Island Book Festival in Feburary. Visit her website at www.lauren-gilbert.com for more information. To celebrate its publication on January 1st 2015, E.M. Powell is giving away a signed paperback copy of The Blood of The Fifth Knight. 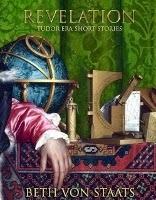 It has already reached #1 in Historical Fiction on Amazon's UK site. The Giveaway ends on Sunday January 04 2015. To see some more information about the book, please click HERE. To enter the draw, comment below on this page and be sure to leave your contact details. Good luck! After I published my previous post on Sir Joshua Reynolds's portrait of Sarah Siddons as the Tragic Muse, I received a message from a reader who asked if I would consider a similar piece on another portrait of the famed actress. Since both theatre and art are two passions of mine, it was a suggestion that I was certainly not going to ignore and so, today, I turn my attention to Thomas Gainsborough's 1785 work, Portrait of Mrs Sarah Siddons. 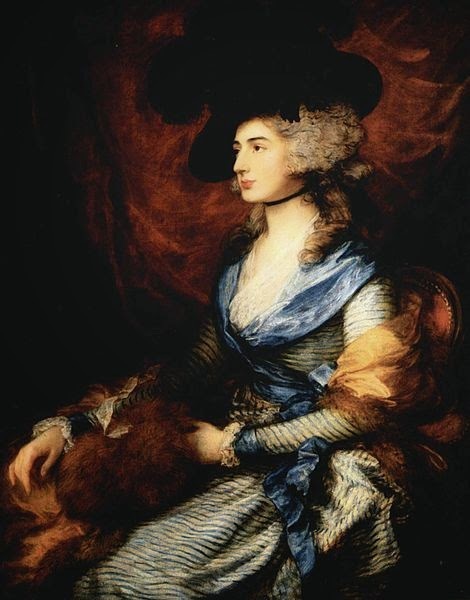 By the time Sarah Siddons sat for Gainsborough in 1784, both were at the pinnacle of their respective fields. Just three years from his death, Thomas Gainsborough had painted some of the most illustrious names in England and though he never officially held the title of Principal Painter in Ordinary to King George III, he remained a particularly well-loved artist at the English court. Siddons, meanwhile, was a theatrical phenomenon, commanding adoring sell-out crowds wherever she performed and moving in the highest social circles in the land. 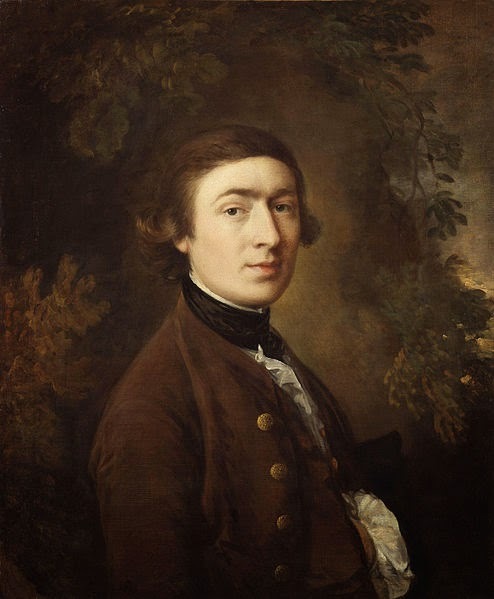 It was, therefore, inevitable that their paths should cross and when they did, the resultant portrait was not one that Gainsborough found easy. If, in 1784, Reynolds painted Siddons as a figure of mythical grandeur, to Gainsborough she is a far less distant subject, and he has stripped her clean of the embellishments of mythology. Though still grand and dignified, he has very much rendered her as a human being, albeit one of fashion and success. Clad in the most up to the minute fashions, Gainsborough does not give the spectator a goddess like that depicted by Reynolds, but a glimpse into Georgian celebrity. Rendered in Gainsborough's justly celebrated smooth, soft brushwork it is almost as though we could reach into the canvas and touch the rich fabrics Mrs Siddons wears, her artfully rumpled skirts falling just so about the chair on which she sits. Whereas she shared the canvas in Reynolds's iconic work, in this portrait there is nothing in the image to distract from the central figure of the actress. Looking off and away from the audience, we are in no doubt from her air of regal self-possession that this is a woman of no small importance. It is the 18th century equivalent of a celebrity publicity shot, constructed and directed to create an impression upon the viewer. Although this purports to be a portrait of Mrs Sarah Siddons, she is in character here just as much as she is on stage and, equally, just as she is when portraying the Tragic Muse for Reynolds. In March 1785, Gainsborough completed the work and the painting was celebrated upon its unveiling at the National Gallery. Recent technological developments have offered us an insight into the methods Gainsborough employed and suggest that the painter did not find his painting of Mrs Siddons an easy one to produce. X-rays on the painting have revealed pentimenti around the actress's right hand and nose, where Gainsborough has painted over the work several times in his search for perfection. Popular art legend has it that, frustrated and distracted by his inability to quite capture Mrs Siddons to his liking, Gainsborough threw down his brush and exclaimed, "Confound the nose, there’s no end to it!”. Happily for all of us, the artist finally did lay down his brush on a completed painting, leaving us with another breathtaking depiction of the most celebrated lady to grace the Georgian stage. Who knew there was a hierarchy of angels? 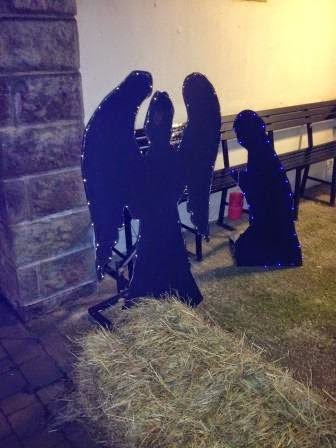 In the festive season, perhaps more than any other time, images of angels are all around us. This was brought home to me during a Christmas visit to the village of St Helens, on the Isle of Wight. 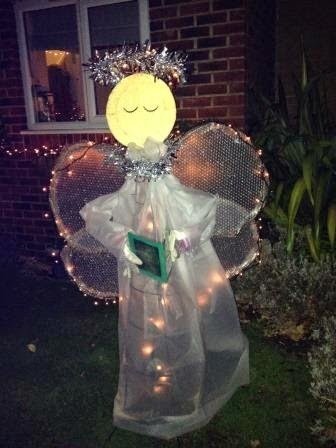 To celebrate the season and raise money for charity, local business' and residents display angels in their windows. 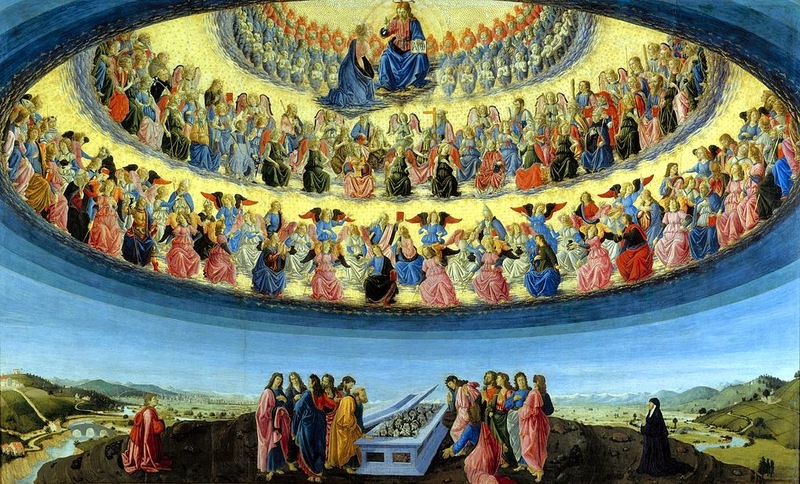 Francesco Botticino's painting of "The Assumption of the Virgin Mary"
showing the three levels of angels. However, it seems even mystical beings like angels are not as straightforwardly ethereal as you might think. Indeed, the Christmas carol with the lines "Sing choirs of angels", isn't necessarily referring to a group of celestial beings quite keen on music, but to the hierarchy of angels known as the "Nine Choirs of Angels". 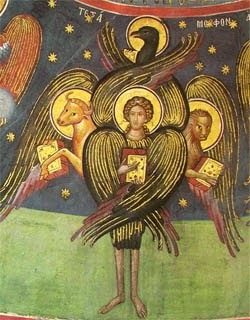 It was medieval theologians who first proposed a system to rank angels in order of importance. It was Thomas Aquinas who drew on passages taken from the New Testament to suggest a three tier system, each subdivided into three, making a total of "Nine Choirs of Angels". Described as the "burning ones" these angels are the highest ranked and caretaker to God's throne. In Isaiah 6: 1-8 a Seraphim is described as being a fiery, 6-winged being: with 2 wings to cover his face, 2 his feet, and with 2 he flew. Ranked number 2, Cherubim are described as guarding the tree of life in the Garden of Eden and the throne of God. They are symbolic of God's power, and in the Book of Revelations are alluded to as celestial attendants in the Apocalypse. Thomas Aquinas postulated that Satan was a fallen cherub. These oddly named angels are slightly more distant from God and need the intercession of a throne in order to appeal to Him. They reside in the area of the universe where material form takes shape, and they represent Humility, Peace, and Submission. Sometimes referred to as "the shining ones" the Virtues govern all Nature and control the elements. The seasons are subject to their command, as are the sun, stars, and moon. It is the Virtues who equip the just with courage, grace, and valor, and are also responsible for miracles. Counter-intuitively these are angels of darkness, who defend the earth and mankind from evil spirits. They are warrior angels and chief amongst them are Samael and Camael. Surprisingly, Archangels rank a relatively lowly number 7 in the heavenly scheme of things. Their name literally means "Chief" or "leading angel", and they have a unique role as God's messenger at critical times in history. Perhaps most well-known is Gabriel who appeared to the prophet David, and to Zechariah to announce the birth of John the Baptist, and proclaim the Annunciation of Mary as mother of God. These are slightly confusing angels who seem to have fallen from grace and be hostile to both God and man. Last, but certainly not least are the angels, the celestial rank and file so to speak. They are God's intermediaries with man, and have the power to observe and then intercede with God on man's behalf. And finally, it has to be said that although scholars used the Bible as a reference source, scripture itself is not overtly illuminating on the subject and so it remains largely a matter of speculation. Grace Elliot is a veterinarian, freelance writer, and author of historical romance. 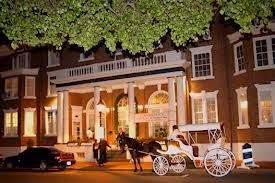 For years I lived near the historic town of Fredericksburg, Virginia, named after the then Prince of Wales, Frederick Louis, father of George III. Poor Fred never did become king. Fredericksburg was an important tobacco-shipping town on the Rappahannock River. I decided to write a Christmas story set during the dawn of the American Revolution, when Virginia, at the time of my story, was still part of England. Researching in the Virginiana Room at the local library, I came across many interesting Christmas customs from this time period—but I found that many originated from earlier eras before Christianity. In the eighteenth century, the cooking would have been performed in a broad, deep hearth, with a wide chimney where meat could be smoked. 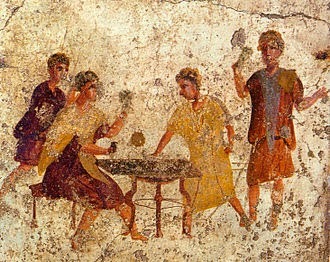 Ham, an expensive cut of meat, was popular for a holiday feast. On December 12th, the Yule Log would be put into the dining room fireplace. This log was kept burning until January 6th with enough left over to kindle the following year’s Yule Log. The custom of burning the Yule Log dates back before medieval times and was originally a Nordic tradition left over from the pagan days of celebrating the Winter Solstice. Mince pies were prepared, basically as they are today. But also a specialty called a "stack" cake would be served. Sweetened, spiced dough was rolled into thin layers, and slices cut using a dinner plate to form a perfect circle. After baking, the cake rose but little. The colonials cooked dried apples and peaches separately, then spiced with cinnamon and nutmeg the fruit was mashed and spread like paste between the cake layers. The cake would be allowed to sit a few days to soak up the fruit. Another cake would be prepared with a bean baked into one slice. The person who got that particular slice became the King of Misrule. He would rule from Christmas day to Twelfth Night, performing various trifling acts to ensure good weather for the next year. He’d also preside over celebrations, and sometimes cause mischief. This custom can be traced back to ancient Rome, when the King (or Lord) of Misrule was appointed for the feast of Saturnalia, and he represented the good god Saturn. During this time the ordinary rules of life were reversed as masters served their slaves. 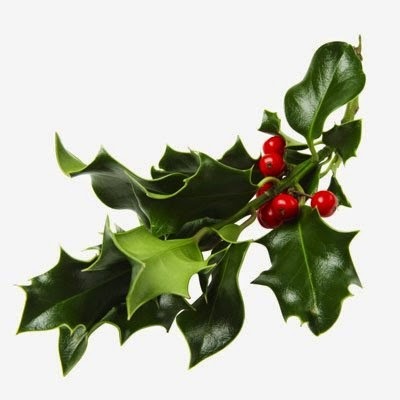 Back to the eighteenth century, for holiday decoration, a Christmas Bush would be fashioned using two wooden rings. Binding the rings side by side, fresh cuttings of evergreen, boxwood and sweet William were added. Bright red apples, some rare lemons and pine cones were included for color. On Christmas day, after dark, the bush was hung in the window with a candle at its center. For a table centerpiece, a wooden cone adorned with headless nails was speared with apples. 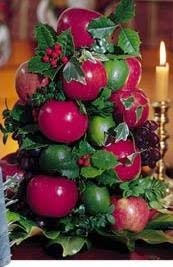 Boxwood was stuffed around the apples, and a pineapple put on the top. On Christmas morning, the people attended church service. 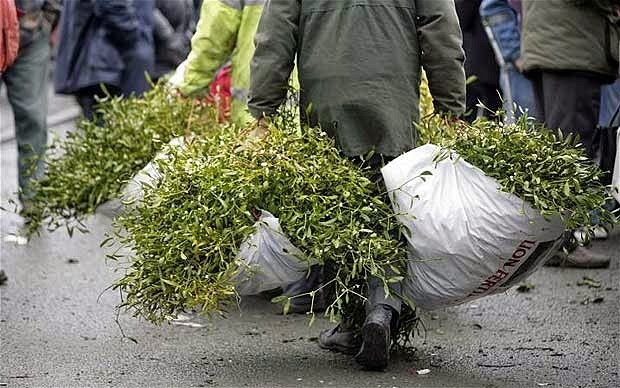 Returning to their residence, the home’s owner would enter the house with two sprigs of holly, thus ensuring he would remain master of his house for the coming year. Then the meal would be laid out for family and friends who might drop by. A punchbowl filled with tea, sugar, pineapple juice and rum was placed next to the centerpiece. As well as the punch, another popular drink was "bumbo" made with rum and sweetened water. Dried figs and nuts were available to snack on. The ham, smoking for hours, was brought out surrounded by sweet yams. Two roasted fowl would be added to the meat choices. The bread was usually cornbread, served with a hunk of butter. Muskets and pistols would be fired outside to augment the Christmas festivity. Celebrations and church attendance on specific days would last until Twelfth Night. This tradition marks the feast of Epiphany, when the three wise men brought gifts to the baby Jesus. Sources: Wikipedia and the Virginiana Room at the Rappahannock Regional Library, Fredericksburg, Virginia. "At my Coronation next June, I shall dedicate myself anew to your service.... You will be keeping it as a holiday; but I want to ask you all, whatever your religion may be, to pray for me on that day - to pray that God may give me wisdom and strength to carry out the solemn promises I shall be making, and that I may faithfully serve Him and you, all the days of my life." Technology is a remarkable thing. Prior to the advent of the wireless radio, the vast majority of the subjects of the kings and queens of first England and Wales, then Great Britain, and ultimately the United Kingdom and the Commonwealth nations never heard directly from their monarchs. Although common people could guess through portraiture and know from photography what their monarchs looked like, unless they had the great fortune to attend an event where the monarch spoke or gained an audience, hearing their king or queen speak directly to them was virtually impossible. There are few people alive in the United Kingdom today who remember a Christmas Day without hearing their monarch speak directly to them. Now a time honored tradition, the monarch's Christmas Broadcast, first delivered by radio, then also television, and now additionally by streaming on the internet, is as ingrained into the British national consciousness as Christmas Eve church services, Father Christmas, choral singing, Ebenezer Scrooge, mistletoe, the Yule log, Christmas crackers, and the delightful, albeit laboriously prepared, flaming Christmas pudding. In 1932, with the growing popularity of the wireless radio, Sir John Reith, a brilliant founding father of the British Broadcasting Company, pitched a novel idea to the Royal Family. Would King George V be willing to speak directly to his people via the wireless radio on Christmas Day as a prologue to inaugurate the Empire Christmas Service? Initially King George was hesitant. Nothing short of him touring the British Broadcasting Company personally convinced him of the brilliance of the idea. Ultimately, after much deliberation, the king agreed. 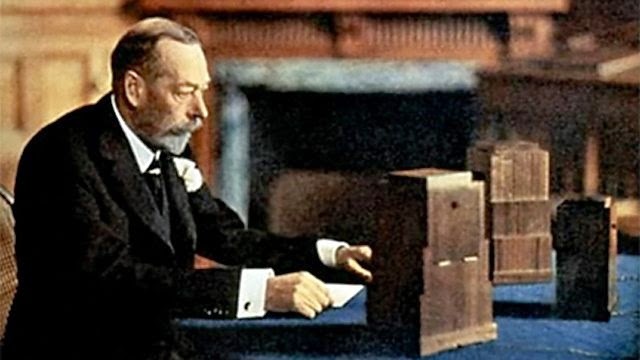 With this simple leap of faith into the modern era, the vast majority of King George V's subjects listened to the voice of their monarch for the first time in history, hearing firsthand the king marvel at the technology that brought him to them on Christmas Day. Leaving nothing to chance, the words spoken from the king were not of his composition, but instead those of renowned poet and author Rudyard Kipling. With an estimated 20 million subjects around the globe witness to the event, King George V's first Christmas Broadcast had an enormous impact upon the British people. Beyond a far more pronounced feeling of closeness to the monarchy, the use of the wireless radio as a means to speak to the realm created a unifying force of patriotism through shared values, hardships, sacrifices, challenges and the ultimate success and victory possible, despite all odds, created from a unified sense of purpose. Though unknown to him at the time, King George V set the precedent and ultimate stage for his son, King George VI, as well as the British government, to galvanize an entire nation to fight for their survival together as one people during the dark days of World War II. Although the monarch's annual Christmas Broadcast was becoming increasing popular, it did not become an annual event until Christmas Day 1939. Overcoming through exhaustive speech therapy a life-long pronounced stammer, King George VI spoke to his people in the midst of the onset of the horrors of World War II. With conviction and valor, King George VI reassured his people by forthrightly telling them, "A new year is at hand. We cannot tell what it will bring. If it brings peace, how thankful we shall all be. If it brings us continued struggle, we shall remain undaunted." 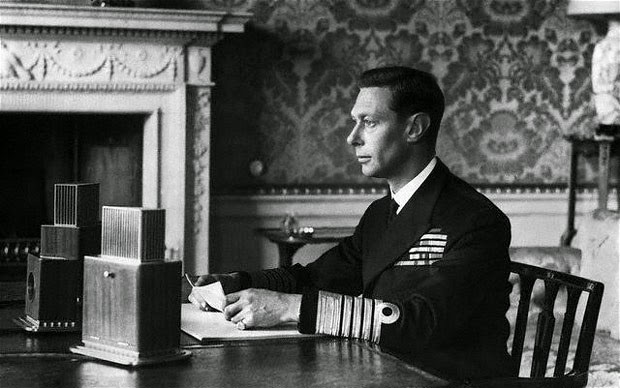 Although King George VI was a constitutional monarch with only the power to advise, his ability to reassure his people through his committed example of true courage and shared sacrifice as communicated through the print media and wireless radio profoundly impacted morale and confidence among the realm that victory was not only possible, but inevitable. Consequently, the Christmas Broadcasts that King George VI conscientiously prepared and then persevering and haltingly articulated during World War II hold a pronounced importance in the history of the nation. 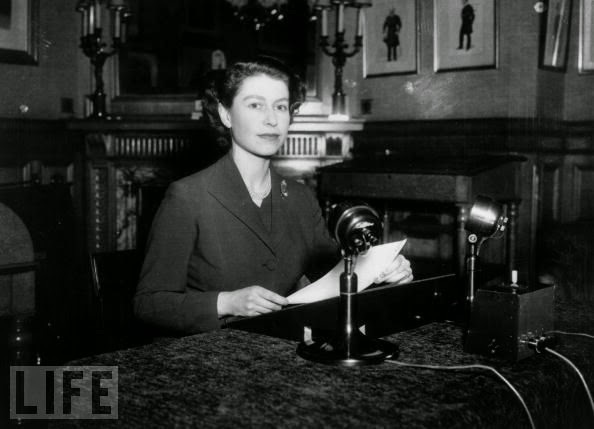 Upon her ascension to the throne in 1952, Queen Elizabeth II delivered via radio transmission a memorable inaugural Christmas Broadcast, asking her subjects for their prayers on her behalf. 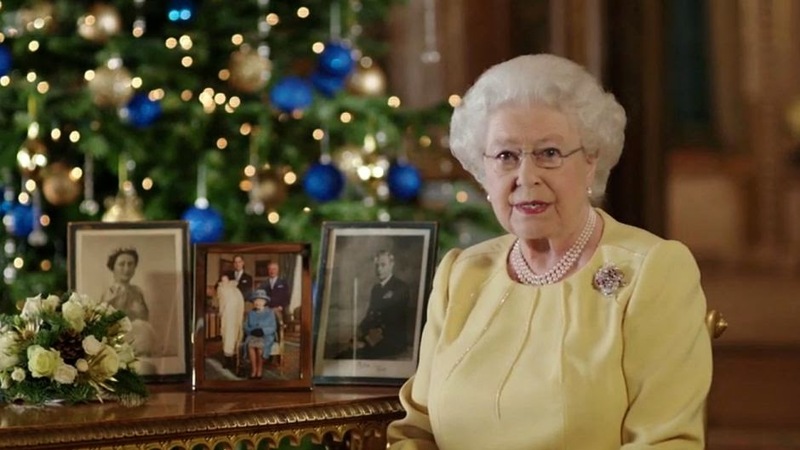 Five years into her reign, Her Majesty then entered a new age of communication by delivering the first televised Christmas Broadcast, broadening and personalizing further still the reach of the monarchy to the people. For the first time in history, common people caught a glimpse of the Royal Family's homes decked for the holidays, further humanizing the monarchy in the eyes of the subjects of the realm. By 1960, to insure all people throughout the Commonwealth nations could view the Queen's Christmas Broadcast, her holiday messages became prerecorded, further increasing the monarch's ability to reach her intended audience. Unlike her grandfather King George V, Queen Elizabeth does not rely on others to craft her words and message. Each year, Her Majesty selects a meaningful theme often driven by current events and builds her speech around it. For example, in 1966, the Queen focused her message to women, telling those listening home and abroad, "In the modern world the opportunities for women to give something of value to the human family are greater than ever, because, through their own efforts, they are now beginning to play their full part in public life." With the advent of the ability to prerecord her broadcasts, Her Majesty also is able to highlight visually events of the year, along with her thoughts and opinions about their impact. Although the Christmas Broadcasts of Queen Elizabeth II rarely hold the historical impact of her beloved father during the war years, her annual conversation with her people sometimes does rise to importance in establishing the monarchy as continually viable. This took on a critical priority in the Queen's 1997 Christmas Broadcast, the first Her Majesty delivered after the tragic death of Diana, Princess of Wales. 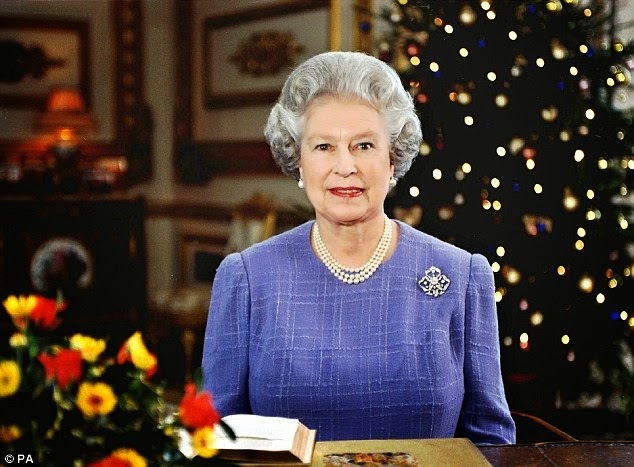 Her affection with the people at its lowest in her reign, Queen Elizabeth's Christmas Broadcast of 1997 provided essential reassurance of her humanity, compassion and love for her family. Now an annual cherished tradition for over 80 years, the monarch's Christmas Broadcast continues to hold an essential role in binding and unifying the United Kingdom and Commonwealth nations, not only in reinforcing the pride and patriotism of the realm's subjects, but also in insuring the continued popularity and vibrancy of their constitutional monarchy. Long may it reign. It is a simple message of compassion... and yet as powerful as ever today, two thousand years after Christ's birth. I hope this day will be as special for you as it is for me. May I wish you all a very Happy Christmas." Author Unidentified, A History of Christmas Broadcasts, The Official Website of the British Monarchy. Logie, Phyllis, Looking at the History of the Queen's Christmas Day Speech, Humanities: Every Topic, Every Angle, 360. Proctor, Charlie, A History of Christmas Broadcasts, Royal Central. 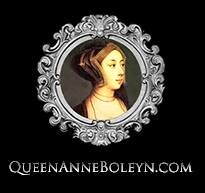 Beth von Staats is a short story historical fiction writer and administrator of Queen Anne Boleyn Historical Writers. Mrs. Frances Anne Crewe was far from the only person sharing such sentiments. Few believed Pitt’s government could survive much beyond the Christmas recess. Indeed, the vast majority in the House of Commons underrated Pitt’s ability to govern. Sir Gilbert Elliot compared Pitt’s newly formed administration to ‘children playing at ministers, and must be sent back to school, and in a few days all will have returned to its former course’ . Pitt’s biographer Lord Stanhope described the challenges Pitt faced when he first took office as ‘the greatest perhaps that any Prime Minister of England ever had to grapple with. Arrayed against him was a compact majority of the House of Commons, led on by chiefs of consummate oratorical ability - by Burke and Sheridan, by Fox and Lord North’ . 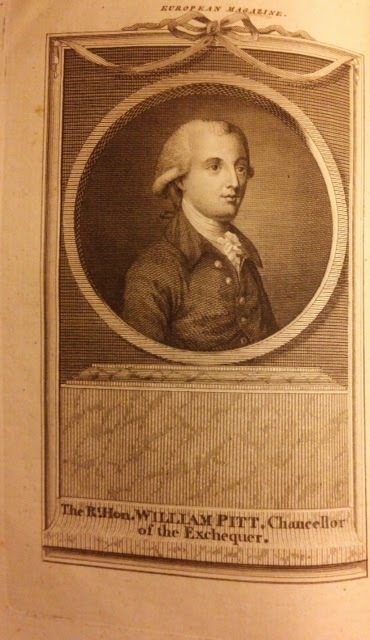 Pitt’s friend, tutor, and later his biographer, George Pretyman Tomline remembered Pitt’s extreme uneasiness in the first days of his administration. 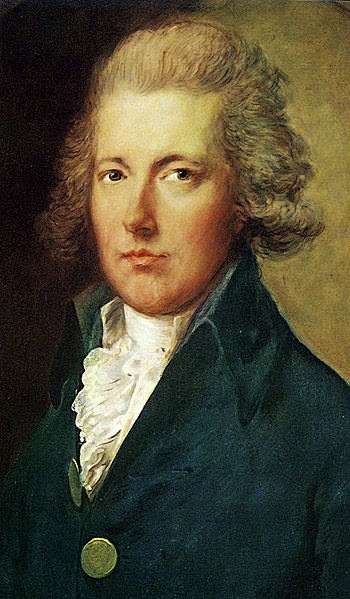 He recalled many years later that in a conversation with Pitt at the end of December 1783, Pitt told him he hadn’t had a moment’s sleep because of the political upheaval . Pitt’s power of resilience, however, was much stronger than his enemies gave him credit. The struggle underpinning the affair was essentially between the Crown’s prerogative to appoint government ministers, and the then Opposition Coalition's majority in the House of Commons. Although Pitt was certainly far from being a mere puppet to the Crown, he firmly stood his ground. When Parliament reassembled after the Christmas recess on 12 January 1784, Pitt was ready for the onslaughts of Fox. Although Pitt’s government was twice defeated, he refused to resign his position. He also declined to call for a dissolution of Parliament. After several months of blatant defiance, courage, tenacity, and sheer force of will, Pitt began to gain the support of the people. He was viewed as defending the King’s royal prerogative; Pitt’s self-confidence and determination began to bring the majority over to his side. Then on the night of 28 February 1784, upon returning to his brother Lord Chatham’s house in Berkeley Square after receiving the Freedom of the City of London, Pitt’s carriage was attacked halfway up St. James’s Street. This attack appears to have been deliberately orchestrated by members of the Opposition and Foxite supporters. Pitt, his brother Chatham, and his brother in-law Lord Mahon were in the carriage at the time. Fortunately, Pitt was left uninjured, but understandably he was shaken up. Despite this attack, his resolve was unbroken, and he would not abandon his post. After the incident, Pitt had more support than ever. The tide had undeniably turned. Finally, on 24 March 1784, Pitt agreed for the King to dissolve Parliament. Nevertheless, the Opposition was not going to give up without one last hurrah. On the very same day, the Great Seal of England was stolen from the Lord Chancellor’s house. A new Seal had to be hurriedly made overnight so that Parliament could finally be dissolved by Royal proclamation on the following day . The original Seal, however, was never recovered. After the resulting general election of 1784, Pitt became MP for his beloved Cambridge University (the constituency where he had previously come bottom of the poll in the 1780 election), and his government was confirmed victorious. Although Fox was returned as Member of Parliament for Westminster, his obstinacy and hatred for the King would bar him from holding a government office for the next twenty-three years. Most importantly, unlike the ‘mince-pie administration’ that Mrs. Crewe and others were expecting, Pitt retained his position as First Lord of the Treasury and Chancellor of the Exchequer for the next seventeen years. He was to hold his seat as the Member of Parliament for Cambridge University for the rest of his life. 1. Reilly, R. (1978) Pitt the Younger. 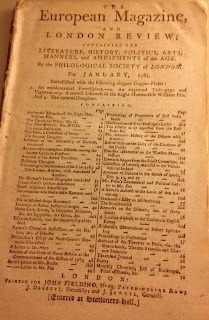 London: Cassell, p. 96. 2. Wilberforce, R.I. & Wilberforce, S. (1839) The Life of William Wilberforce, Volume 1. London: John Murray, p. 48. 3. The Countess of Minto (ed.) (1874) The Life and Letters of Sir Gilbert Elliot, First Earl of Minto, Vol. 1. London: Longmans, Green, and Co, p. 91. 4. Stanhope, Philip Henry (1861) The Life of the Right Honourable William Pitt, Vol. 1. 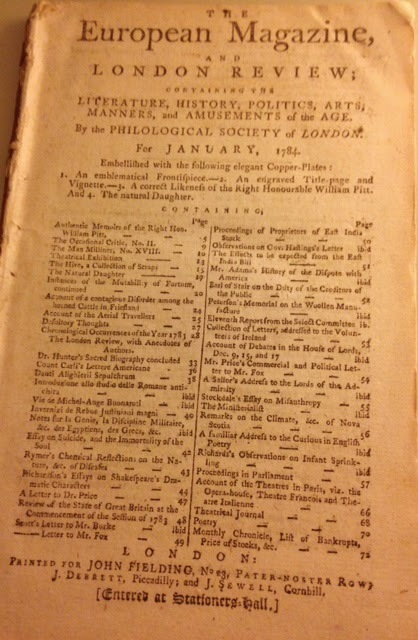 London: John Murray, p. 169. 5. Tomline, G. (1821) Memoirs of the Life of the Right Honourable William Pitt, Vol. 1. London: John Murray, p. 233. 6. Reilly, R. (1978) Pitt the Younger. London: Cassell, p. 104. This week, Lauren Gilbert is giving away a signed, paperback copy of HEYERWOOD: A Novel to each of two winners: one in Canada and one in the US. For more information about the novel, please go HERE. Comment below to enter the giveaway, and please be sure to leave your contact information. But when you read the poem, you get the feeling that the belief is based on the characteristics of the plants. The herbs have their own personalities and are addressed as "you" and "she." Mugwort, "the oldest of herbs," is strong. Plantain, the "mother of herbs," has withstood trampling. Lamb’s cress or hairy bittercress grows from rock. Nettle is harsh, as anyone who has been stung by one will attest. The plants will use these traits to fight poison and infection. See a translation of the poem here: "Nine Herbs Charm" from Karen Louise Jolly's Popular Religion in Late Saxon England: Elf Charms in Context. 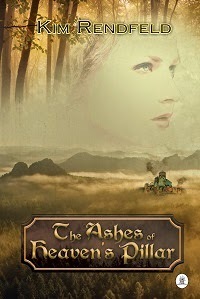 Kim Rendfeld drew on the charm as she was writing her latest release, The Ashes of Heaven’s Pillar (2014, Fireship Press), a story of a Saxon mother and the lengths she will go to protect her children. 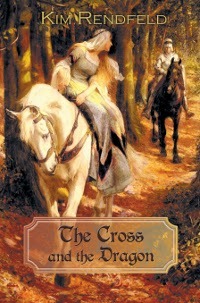 To read the first chapters of Ashes or Kim’s debut, The Cross and the Dragon (2012, Fireship Press), or learn more about her, visit kimrendfeld.com or her blog Outtakes of a Historical Novelist at kimrendfeld.wordpress.com. You can also like her on Facebook at facebook.com/authorkimrendfeld, follow her on Twitter at @kimrendfeld, or contact her at kim [at] kimrendfeld [dot] com. Kim's book are available at Amazon, Barnes & Noble, and other retailers.